925 Sterling silver candlestick set and matching tray. Shabbat Candle lighting is 1 of the 7 commandments that were instated by our sages and not at mount Sinai. It was actually king David that implemented lighting Shabbat candles as candles were used to keep homes lit and bright, the masters of Jewish thought were concerned that darkness may be a probable reason to trigger friction as some house member may mistakenly hit another when walking in the dark. It is customary to give a pair of candlesticks to a Bat Mitzvah as she is starting to light the Shabbat candles. 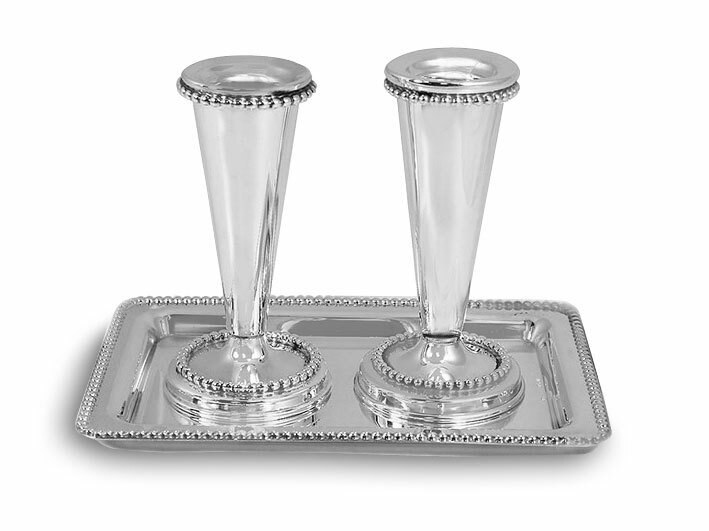 This lovely sterling silver set and matching tray will be a perfect quality choice for this purpose. Dimensions: Candlesticks 4" H. Tray 5 3/4" x 4". Personalization: You will be given the option to engrave as you proceed to checkout.